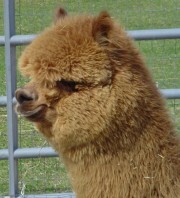 Calix was born 5/23/06 and during his vet check the assistant declared him the “alpaca poster child for cuteness”! Calix is often referred to by visitors (and now us) as “The Bear”. His fiber is pretty amazing (dense, crimpy with excellent coverage and a long staple length) and he’s really developing into a striking male. We are quite pleased that his fiber is holding its fineness so well, and his 2009 sample remains at the same AFD as his 2007! Calix has great balance and style. At the Green Mountain Alpaca Fall Spectacular the judge felt he certainly displayed the attitude of a herdsire (he does have his sire’s personality! 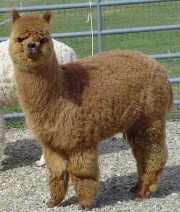 ), and awarded him 3rd for his overall typey style, consistent fleece characteristics and exceptional regrowth. Calix has begun breeding. His first offspring is on the ground and we’re so pleased! Calix is available for breeding at your farm (mobile) or at ours (drive-by). Contact us for more details. 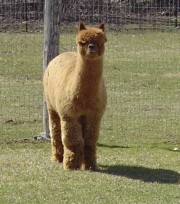 Calix is proudly co-owned with Amber Moon Alpacas.